Fire is an important natural process. 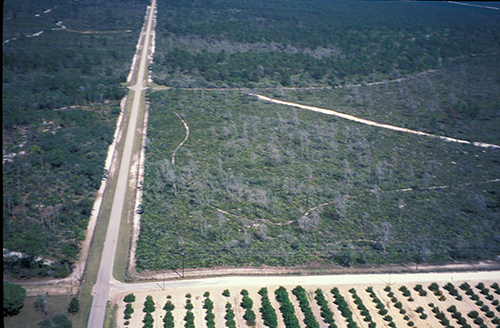 Most Florida ecosystems burn frequently. Some, such as sandhills, cutthroat seeps and flatwoods burn as often as every 2-5 years. Scrubby flatwoods and more xeric scrub burns less frequently, perhaps every 6-20+ years. Before settlement, wildfires burned across thousands of acres at a time. Lightning-ignited fires were common, beginning in late April and extending through July or August. Today, due to the fragmentation of the landscape by agriculture, housing developments, and roads, wildfires cannot move across large areas as they once did. Wildfires are usually extinguished at the smallest possible size in order to protect housing. Because we cannot rely on wildfires, prescribed burning is used under controlled conditions to maintain the native structure and function of the habitats found on the Station property. Prescribed fires are used to: mimic natural processes, provide research and educational opportunities, enhance habitat for threatened and endangered species, and reduce fuels around structures and roads to limit the hazards associated with wildfires. Photos are also useful to provide a visual example of changes over time as a result of wild and prescribed fires. The series below is an example of change on Red Hill. Other examples can be found in the extensive photopoint collection started in 1992. Aerial photo of Red Hill in 1933. 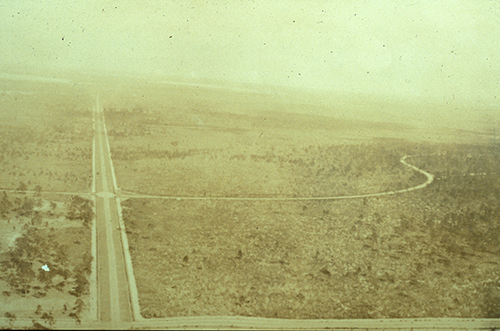 Note open vegetation structure after a major wildfire in 1927. © Archbold Biological Station. Aerial photo of the same area in 1984, after 50 years without fire. Sand pines have covered most of the site. Photo by Ron Myers. © Archbold Biological Station, 1984. 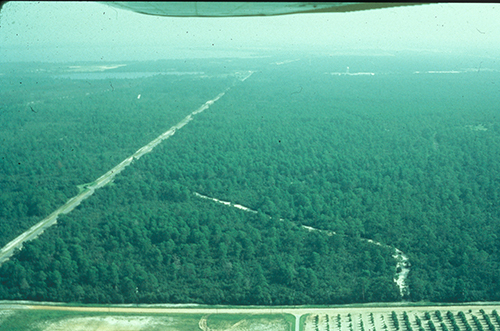 This photo was taken in 1996, three years after the first prescribed fire on the site. Sand pine snags cover much of the area. Photo by Kevin Main. © Archbold Biological Station, 1996. By 2004 most of the old snags have fallen and young sand pines are beginning to cover the site again. Photo by Kevin Main. © Archbold Biological Station, 2004. The Fire Management Plan provides a framework under which units are selected for burning, along with details about planning, training, preparations needed before a burn and weather conditions under which prescribed burns are conducted. Based on the fire history for each unit, and the fire return interval set up for each unit, a map is created each year that shows which units will potentially be burned (see Fire Scheduling). Staff and visiting researchers also provide input on units that should be included or excluded from burning in any given year. Researchers are required to input their research needs in the Archbold Metadata Database so that burning constraints or burns outside the prescribed schedule can be taken under consideration. Contact the data manager. Fire return intervals. These intervals are set based on modal vegetation types within each unit. Units with flatwoods, cutthroat, and sandhill generally are burned more frequently than scrub units. Map by Kevin Main. © Archbold Biological Station, 2010. Prescribed fires can be conducted at any time of the year. Season of burn is not specifically set by the Fire Management Plan. However, most native habitats are burned in the growing season (April-September). Burns in altered habitats, such as the pastures on the Reserve, are burned in both the growing season and the dry season. Weather is an important consideration when planning burns. The acceptable ranges for wind direction, temperature, relative humidity, dispersion index, and time since rain (drought conditions) are specifically described in the prescription for each burn unit. Weather data is compiled on site and also acquired from the National Weather Service and the Florida Division of Forestry. An indication of long-term drought conditions can be obtained using the Keetch-Byram Drought Index, compiled on site and by the Division of Forestry. Fire preparations include disking firelanes, mowing unit edges and felling snags as needed. Burn authorizations are issued by the Florida Division of Forestry. Local authorities and neighbors are also informed before a burn is conducted. Additional considerations before burning a unit include scrub-jay nesting, presence of Florida Panthers in the area (rare), black bear denning, removal of research equipment (or plans to avoid burning equipment), and available fire crew. 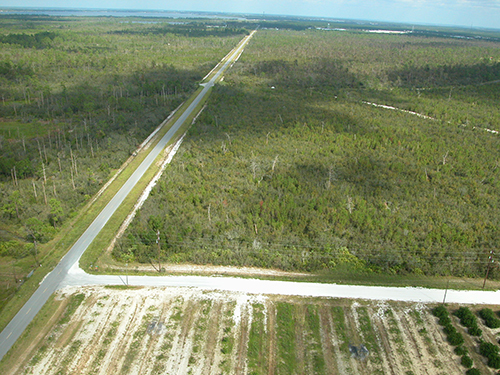 Assistance on controlled burns is often provided by local land management agencies, including The Nature Conservancy, the Florida Fish and Wildlife Conservation Commission, and the Florida Division of Forestry. A crew size of 4-10 people, or more, is required depending on the size of the unit, fuel load, and distance to roads and housing. When conducting a burn, fires are usually started as soon as fuels have dried out, around 10:00am. Often crews work to create a blackline (burned out area) on the downwind side of the unit. This widens the functional width of the firebreak between the unit and any downwind units, reducing the chance of an escaped fire. After blacklines have been established, lighting continues around unit edges and/or within the interior of the unit. Often much of each unit is burned out with a headfire, burning quickly with the wind. Headfires in scrub are very intense, often with flame heights over 20ft. Well trained crews are necessary to burn units in such a way as to limit escapes into adjacent units. Fire vehicles are also necessary. On most burns three or more brush trucks are used, along with one or two ATV’s. Archbold staff in charge of conducting burns are Certified Fire Managers, having received training and certification from the Florida Division of Forestry. All fire crew members must have some level of training before being allowed to work on a fire at the Station. An internal training opportunity is provided several times a year to give visiting scientists and interns the option of participating on a burn. All fires, whether very large or very small (such as burns done for research or small lightning-strike fires extinguished by rainfall), are mapped on the Station’s GIS system. The fire intensity is mapped on a scale of 0-3, with 0 being unburned and 3 being totally consumed. Mapping is done with post-fire aerial pictures that can be used by matching the pictures to geo-rectified imagery on a computer, then digitizing intensity boundaries onto the GIS. Intensity boundaries are also field checked. Fire intensity files are stored on the GIS server as shapefiles. A sample of the intensity boundaries is shown below. 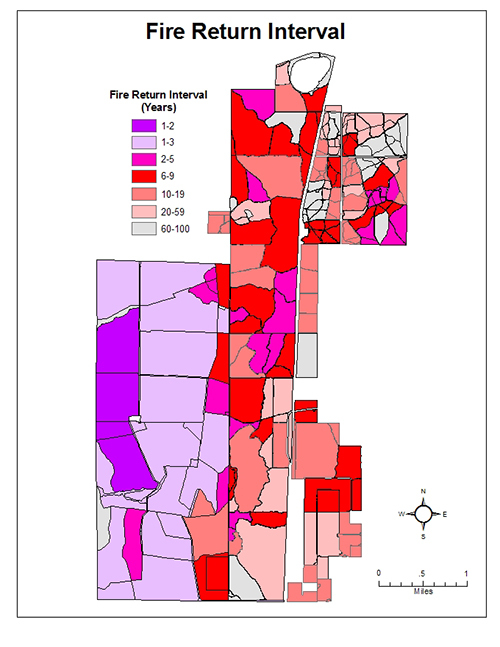 Staff and visiting researchers often consult the historical database of fires mapped onto the GIS system to determine the last fire in a particular area, fire intensity for a given area, or the number of times fire has burned an area since record keeping began. Sample GIS map showing the locations of the fires on the Station in 2008. Intensity classes are as follows: 1-patchy burn, some small areas unburned, 2-no unburned patches, most vegetation scorched, small patches totally consumed, 3-totally consumed. Map by Kevin Main. © Archbold Biological Station, 2010. Fire management at the Station is more than habitat maintenance. Researchers rely on prescribed fire and the associated monitoring when making research plans. If you need assistance acquiring data for potential research sites, please speak with the Land Manager or the Program Manager with whom you will be collaborating. Specific questions about fire management, and the fire management plan, can be addressed to the Land Manager.